Fwd: Abandoned Bike in Your Neighborhood? Subject: Abandoned Bike in Your Neighborhood? My name is Joe DeFelice and I am the newly elected Chairman of the Mayfair Community Development Corporation commonly known as the Mayfair CDC. 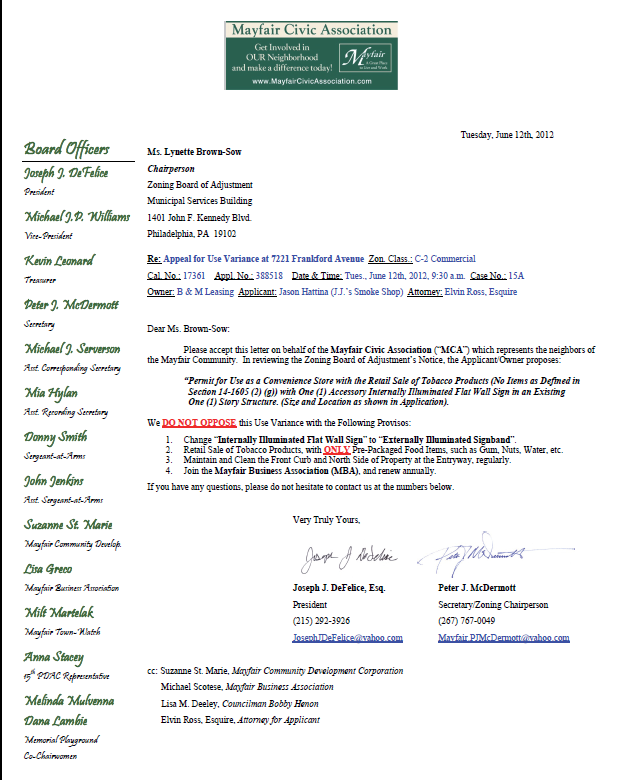 I have been a board member with this organization since last May however have been involved at the community level for quite some time serving as President of the Mayfair Civic Association and a Board member of the neighborhood Townwatch and Business Association. Nevertheless my roots in this community go back to my birth and upon marriage I bought a house a block and half from where I grew up. The neighborhood is not the same as it was when I grew up but change isn’t always a bad thing; it is how one affects that change that is the often difference maker. In the 1990s Mayfair was a community that saw an extreme majority of home ownership made up by a mostly blue collar parochial population. In order to salvage that identity, Mayfair sought to get ahead of the curve by not waiting for decay to meet it, as it did so many other communities in the lower Northeast, but rather to begin revitalization before bottoming out. 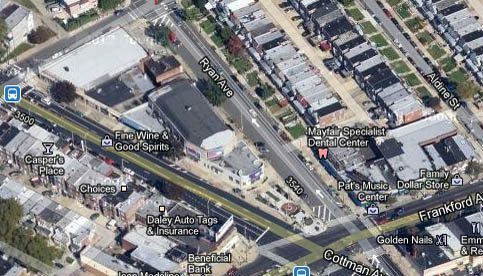 The Mayfair CDC covers an area between Harbison Avenue to the South to Rhawn Street in the North to Roosevelt blvd on the West side and Frankford Ave to the Eastside North to Cottman then to the river North to Sheffield Ave centered around the Northeast Philadelphia neighborhood known as Mayfair. It was created in the late 1990s to combat blight before it began. The concept was that, rather than investors coming in and taking advantage of our premier housing stock of rowhomes and twins with parking spaces and yards ranging from 1200 – 2000 sq feet just a short car/public transportation ride from Center City, the neighborhood would invest in for sale properties thus keeping them off the market. The neighborhood would renovate these properties and sell them to family members of other Mayfair community members thus making our neighborhood more tight knit and family centered. Thus the Mayfair Community Development Corporation was founded and for the first half decade of its existence it operated at high functioning level thanks in part to grants from former House Speaker John Perzel. The Mayfair CDC has been a successful neighborhood partner for years and renovating and rehabbing houses has only been a small part of their efforts. Since our inception, we have renovated the Devon Movie Theater, renovated a pocket park known as Mayfair Memorial Park, built the Mayfair Community center which is a state of the art recreation center at the heart of our neighborhood, rebuilt, with the assistance of the Mayfair Civic Association and brand new playground at Lincoln High School valued at $80,000, we have taken over operations of local neighborhood establishments such as Schaaf’s Market, started a cleansweep program that maintained our residential and commercial corridors and planted hundreds of trees and flowers in and around our main thoroughfares such as Cottman and Frankford Avenues. This type of neighborhood improvement has stabilized Mayfair while other communities in the area saw much more drastic change. In the mid 2000s, housing prices began to skyrocket and the Mayfair CDC’s ability to keep up with and be able to pay for the amount of properties for sale began to lag. The average home price in Mayfair rose from $80,000-$100,000 to between $140,000-$200,000. These prices presented a conundrum for our stable neighborhood: longtime home owners began to jump at the chance to nearly receive double their home value and the Mayfair CDC couldn’t keep up with the high level of buying and selling. As we all now know, the mid 2000s were high times for investors and Mayfair was not spared. The amount of investors changed the landscape of the neighborhood, blocks that were once almost entirely owner occupied began to see an increase in renters and vacant homes. In our community that has lead to a significant amount homes that were not properly maintained or cared for by either the renters or the home owners. Since the influx of renters, the issues related to these renters have risen abundantly. No longer could a neighbor, in many cases, simply knock on a door and ask the person who answers the door to fix their sidewalk, put lids on their trash cans, turn their music down etc. This became difficult because the amount of turnover in these rental properties produced new faces quite regularly. Gone were the days when you would see that familiar face. Gone were the days that the person responsible for fixing the sidewalk lived in the house of the door you knocked on. When you went to lodge complaints to a property denizen, it fell on deaf ears so you had to try and contact the landlord and many times those calls were made to area codes in North Jersey or New York City normally to someone who spoke none or very little English. This has been extremely detrimental to our community. Many neighbors, who were here for several generations are beginning to or have thrown their hands up and sought housing elsewhere; it seems that we contact our local state representative or city councilperson almost daily with issues that deal primarily with negligent or reckless tenants or absentee landlords. I personally spent my time recently on the phone with a landlord from Montgomery County about getting his tenants to be more respectful to their neighbors on the 3100 Brighton Street. This has lead to both the landlord and our Townwatch president staking out the house and documenting the issues which rain from loud music, to abundant dog feces, to using the back bedroom window as a trash shoot into the backyard. However, this landlord has been exception, atleast he returns the calls or makes it look like he cares what his tenant is doing to our community. It is the other kind, the absentee landlords, whose behavior or lack thereof eats through the fabric of our neighborhood and we have plenty of them. On the 3400 block of Cottman Ave nearly half the block is comprised by renters many of whom last a year or less in that property. Their block is one of the gateways into our neighborhood repairs to fronts and facades are few and far between. On the 3300 block of Guilford Street, for three years the block was under siege by two renters who disregarded common decency and engaged in regular illegal activity, it wasn’t until these tenants beat their landlord for rent that the landlords threw up their hands from New York City and put the houses back on the market; thankfully those houses were sold to Mayfair residents and an Iraq war veteran. 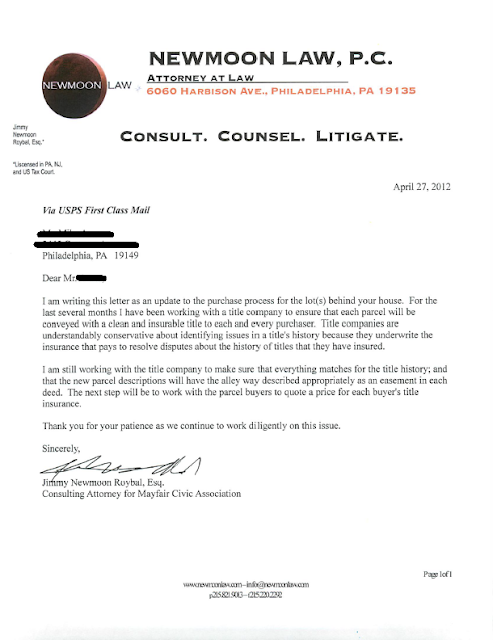 In a twin on the 3100 block of Nesper Street, a neighbor has had to call an exterminator atleast five (5) times in the last six (6) weeks to combat roaches from his nextdoor neighbor, when knocking on the door was no longer an option, we had to call Councilman Henon’s office in order to send out Licenses and Inspection as well as the City’s Health Department. On the 2800 and 2900 blocks of Unruh Avenue Street, longtime neighborhood residents are fed up after having neighbors allowing animals to defecate across all their lawns, blast their music, deal drugs, etc. Thankfully former Councilwoman Joan Krajewski’s office interceded on several occasions finally leading the landlord to issue an eviction letter. However, decent hard working people should not have to live like this and we shouldn’t need our elected officials to intervene for the purposes of decency and cleanliness. Now, thanks to the efforts of Councilman Henon and his City Hall App, we have become more vigilant in tracking and identifying negligent property owners and tenants. This App has allowed us to gain insight into the real problems confronting the community and his staff has been bulldogs in tracking down and resolving the issues; which have been the types of complaints we have received in the last three years. I personally handle anywhere from two to five complaints a week that somehow comes back to an absentee landlord or a laissez faire tenant. We are here to help and hope that our example will show our new neighbors the type of behavior that we expect in our community. We are committed to combating blight and quality of life issues and will strive, through many difficulties, to continue to make Mayfair a great place to live, work and play. Thank you. The below was sent to us by the Appellees in the Zoning Appeal against the Healing Way Methadone Clinic and asked that I forward. 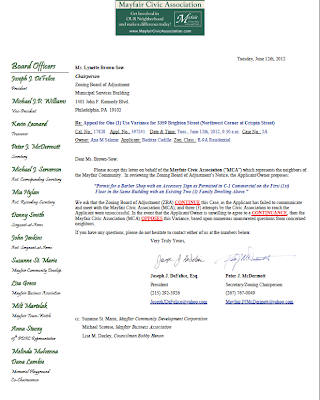 The appellees in the suit against the THW are planning a demonstration at 7900 Frankford Avenue on July 19, 2012 at 6PM. The purpose of the demonstration is for the community to once again come together in a show of unity and request that the THW withdraw their appeal. The Mayfair Civic Association is assisting with the planning and coordination of this event just as they did last year. We are extending an invitation to you to participate in this event and hear the community on this very important community issue. This is a follow-up story to our coverage in “District 172: The Politics of Change after State Rep. John Perzel,” a collaborative effort with Philadelphia Neighborhoods funded by J-Lab. If any assumption was ever made about the Northeast, by any Philadelphian, it would be its position as a younger brother to Center City Philadelphia, not unlike Philadelphia in comparison with New York. However, Mayfair Civic Association President Joe DeFelice said that was an image his neighborhood aimed to defy. One year ago, after and extreme fundraising effort, DeFelice met with NEast Philly to discuss the renovation and reopening of the Mayfair Memorial Playground. At the time, Mayfair was struggling with the recent political changes caused by the indictment of Pennsylvania House 172nd District’s Rep. John Perzel. The indictment, coupled with a downturned economy, forced the district into a difficult era. State grants, which were freely given in previous years, dried up. Pennsylvania voted in a Republican governor and a Republican majority who created serious budgetary constraints. In the 172nd District freshman Rep. Kevin Boyle was elected in 2010. That was where DeFelice and company defied odds. Mayfair saw community activism unparalleled in many other Northeast neighborhoods. A combined effort from Mayfair community organizations brought about positive changes and strengthened the local voice. 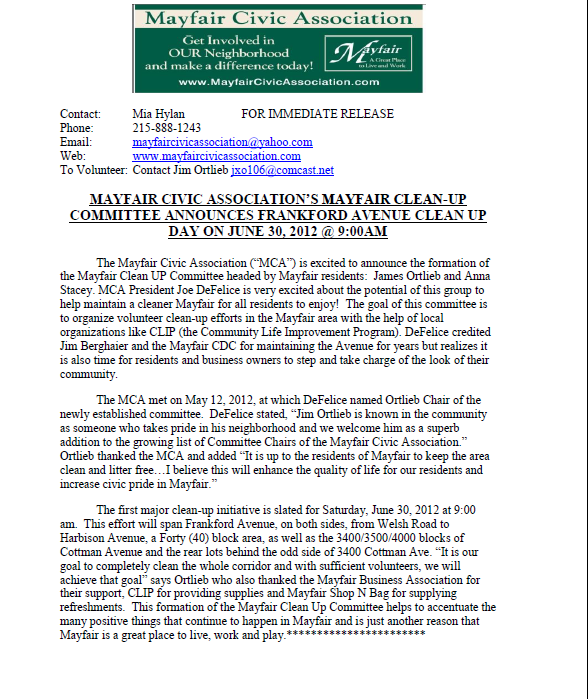 The Mayfair Civic Association (“MCA”) is excited to announce the formation of the Mayfair Clean UP Committee headed by Mayfair residents: James Ortlieb and Anna Stacey. MCA President Joe DeFelice is very excited about the potential of this group to help maintain a cleaner Mayfair for all residents to enjoy! The goal of this committee is to organize volunteer clean-up efforts in the Mayfair area with the help of local organizations like CLIP (the Community Life Improvement Program). DeFelice credited Jim Berghaier and the Mayfair CDC for maintaining the Avenue for years but realizes it is also time for residents and business owners to step and take charge of the look of their community. One (1) Story Structure. (Size and Location as shown in Application). 1. Change “Internally Illuminated Flat Wall Sign” to “Externally Illuminated Signband”. 2. Retail Sale of Tobacco Products, with ONLY Pre-Packaged Food Items, such as Gum, Nuts, Water, etc. 3. Maintain and Clean the Front Curb and North Side of Property at the Entryway, regularly. 4. Join the Mayfair Business Association (MBA), and renew annually. If you have any questions, please do not hesitate to contact us at the numbers below. 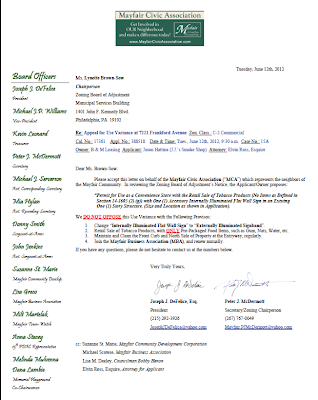 We ask that the Zoning Board of Adjustment (ZBA) CONTINUE this Case, as the Applicant has failed to communicate and meet with the Mayfair Civic Association (MCA), and three (3) attempts by the Civic Association to reach the Applicant were unsuccessful. 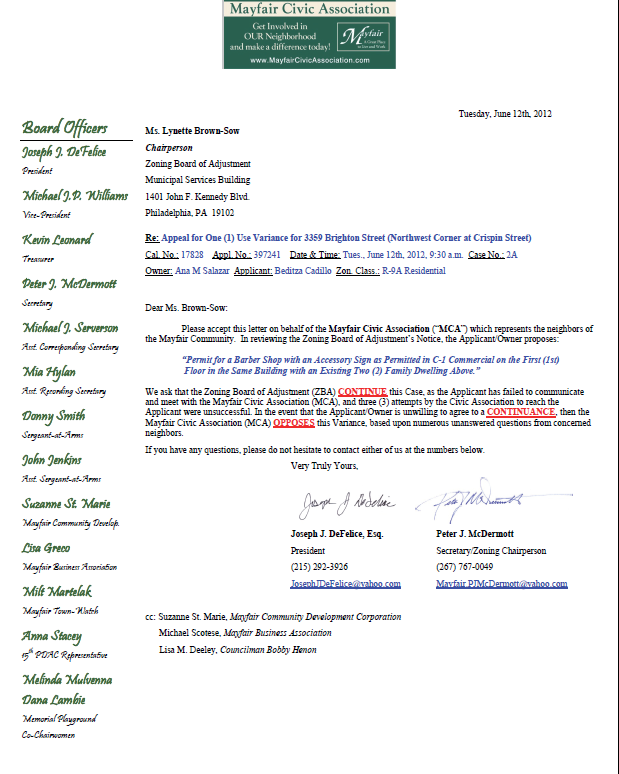 In the event that the Applicant/Owner is unwilling to agree to a CONTINUANCE, then the Mayfair Civic Association (MCA) OPPOSES this Variance, based upon numerous unanswered questions from concerned neighbors. If you have any questions, please do not hesitate to contact either of us at the numbers below. The Mayfair Civic Association (“MCA”) is excited to announce the formation of the Mayfair Dog Park Committee headed by residents of Mayfair and dog owners, Megan Whalen and Michael Ennis. MCA President Joe DeFelice is very excited about the potential of this group to succeed in installing a fenced-in, off leash dog park for the residents and neighbors in Mayfair and the surrounding communities. Whalen cites the many dog parks formed in other parts of the city and the complete lack of officially sanctioned dog parks in the Northeast as a huge hole in the fabric of the Northeast Philadelphia community. "A neighborhood dog park in Mayfair is essential to the community. Many people consider their pets, especially dogs, as members of their family. The goal of this committee is to create a safe and well-maintained space for the dogs, where dog owners can meet and socialize with other like-minded and animal loving neighbors. It can only add to the appeal of the Mayfair, making it a more desirable place to live for residents of all ages." Added Ennis, "At the two informal meetings we held, we've have a wide range of age groups interested in this project; from young professionals, to families, retirees and city employees. We feel it is in the best interest of the area as a whole to see this project succeed. We see this dog park as an opportunity to bring all of our community together in a common space that will be used by not only our 2-legged friends, but our four-legged ones as well." Ms. Whalen, Mr. Ennis, and MCA Communications Secretary Mia Hylan recently met with Barry Bessler, chief of staff at the Office of the First Deputy Commissioner of the Philadelphia Parks and Recreation Department to discuss possible locations within Pennypack Park. Philadelphia Parks and Recreation recently merged with the Fairmount Park Commission who manages much of the open green space within the Mayfair community. Although the group is cautiously optimistic about finding a location that will be mutually beneficial to both the Mayfair community and parks system, there are still many obstacles that need to be addressed; the largest of which is fundraising enough money to install a 6 foot fence around the 2/3 of an acre to a full acre of ground, which is the recommended amount of space for a dog park. Fair, where we held a doggie treats bake sale and a Dog Pageant, we were very encouraged by the community. This project may take awhile to get off the ground and we're asking neighbors with dogs, general animal lovers, or just neighborhood proponents to get involved by joining our Facebook page at Mayfair Dog Park or by emailing us at dogpark215@gmail.com. For now, this will be the primary form of organizing meetings and communicating progress." said Hylan. "The amount of interest in this project is going to be one of the greatest gauges of whether we will succeed in actually installing a dog park somewhere in the neighborhood." Within the next couple of weeks, Whalen and Ennis plan on scheduling another more public meeting to discuss fundraising ideas, the eventual establishment of a 501c3, establishing a bank account, and narrowing down some of the options presented by Mr. Bessler for potential locations. They also plan on doing some door-to-door visits and grassroots outreach to neighbors and dog owners to generate more interest in the cause. 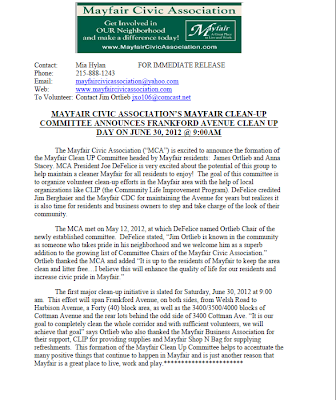 Mayfair Civic Association and Mayfair Clean Up Committee Announce Frankford Ave Clean Up! Please report to Frankford and Cottman Avenues @ 8:30am – 9am for instructions. Contact Committee Chair Jim Ortlieb at jxo106@comcast.net with any questions. C'Mon out and pitch in to help clean up the Neighborhood! The Oxford Circle Farmers Market is open. Frankford’s market will open later this month. Is Mayfair next? The Mayfair Civic Association is celebrating a City Council amendment to part of the code about Philadelphia’s sidewalk sales.